An opening page features a printed copy of a letter written by Diana stating that her son William inspired the sale, and the volume boasts of magnificent full-colour images of every dress to be sold. Boston: A rare, signed catalogue of dresses worn by Princess Diana, sold for charity in 1997, may fetch $7,000 at an auction in the US. The purple leatherbound hardcover catalogue "Dresses from the Collection of Diana, Princess of Wales" has 204 pages. The prefatory page is prominently signed "Diana" in black ink, according to US-based RR Auctions. The catalogue is accompanied by the original absentee bid sheet, an invitation and RSVP card for a viewing of the dresses, catalogue order forms, and newspaper clippings about the sale. 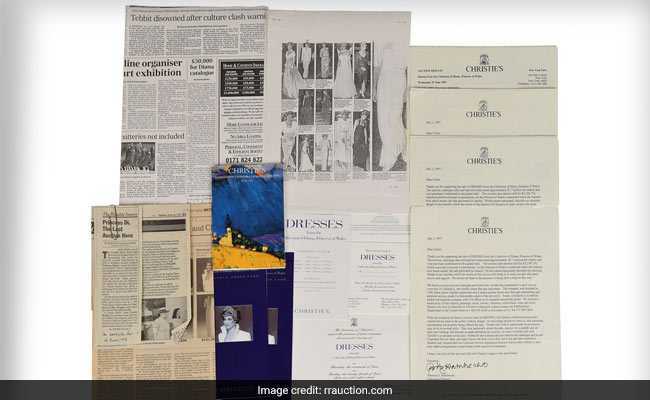 Christie's released the luxurious limited edition signed deluxe version of the auction catalogue for their charity sale of dresses from Diana's wardrobe dating back to 1997. The sale, which benefited AIDS and cancer charities, was held on June 25, 1997, and raised over $3.6 million. The highlight of the sale was Princess Diana's off-the shoulder, midnight-blue velvet dress designed by Victor Edelstein, famously worn during a dance with John Travolta at the White House in 1985, which brought in $222,500. Bidding for the online auction closes on January 10.